It's all well and good to produce monthly favorites lists, but I think we all get caught up in the excitement of new products and may have a tendency to overlook the products we buy over and over again. At least I do! But what better sign that a product is truly a favorite than to repurchase it time and time again? Because I have an unseemly amount of makeup, I rarely use up color cosmetic items. 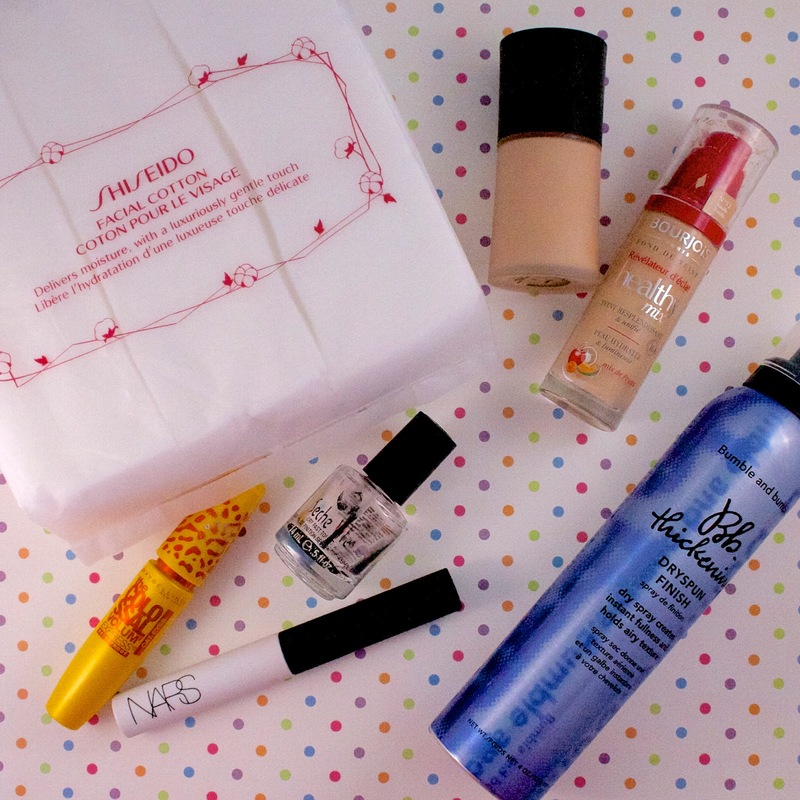 But there are some basics + some other beauty items that I've realized I consistently repurchase. Some of them are my 'holy grails' and I would never consider using another product to replace them. Others are simply ones that I've probably repurchased out of habit, but I like them enough to go back time and time again, so there must be something good about them! I've recently ordered the Oribe Dry Texturizing Spray, so I'll soon be able to compare the two. But for now I will say that the Dry Spun Finish is like a dry shampoo/hairspray hybrid without the bad smell or weird gritty feeling on your hair. It helps hold my style plus give it a bit of that 'second day hair' look that we all strive for! This is easily my favorite foundation of all time. Even though I have very oily skin, I do not tend to like matte foundations. Like everyone else, I want a little bit of a dewy glow to my skin and this foundation gives me that every time. It makes my skin look so much better than it really is and it photographs amazingly well. If you have been futilely seeking your perfect foundation, give this a try. I am convinced that any and everyone will love this! The first eyeshadow primer I ever used was the Urban Decay Primer Potion. I then dabbled in a bit of Benefit Stay Don't Stray and Too Faced Shadow Insurance. All of those became obsolete when I discovered the NARS Pro Prime. It doesn't give any shimmer or color to the lid, but it ensures that any shadow will last all day + then some on my lids. I think it also works well to make the colors more vibrant. And one tube of this lasts for ages (especially if you pull the stopper out so you can get to all of the product in the tube). I don't use Seche Vite everytime I paint my nails, but it is the only top coat that I've repurchased time and time again. I'm not a patient person and I hate waiting for my nails to dry, so a fast dry top coat is a must for me. Seche Vite leaves the nails very shiny, which I also like. My only complaint is that it causes certain polishes to 'shrink' or pull back from the tips of my nails. Oh, and the fact that it apparently contains some toxic chemicals isn't great, so use it in a well ventilated room. Like with my top coat, I mix it up with mascaras and normally have a few different ones in rotation. Maybelline Cat Eyes Waterproof is always one of them. I've recently switched over to Maybelline Full n' Soft, but Cat Eyes still holds a curl better than any mascara I've ever found! Until about a year ago the only facial cotton I had ever used were the standard cotton rounds you find at the drugstore. I always thought it was a ludicrous idea to spend money on fancy cotton that you were going to use and then throw away. All of that changed after I tried this. Not only is it much softer (especially important when using it with an eyemakeup remover), it doesn't shed or leave fibers on your face like the drugstore ones do. Plus, although a pack of this costs $9.50, it comes with more sheets than a drugstore pack, making the price virtually equivalent. Totally worth it. On days when my skin isn't looking so hot, I often opt for the Bourjois Healthy Mix Foundation. It gives good coverage without looking heavy or cakey and has excellent staying power. I think this may have been recently reformulated, but I've tried it both the old and new packaging and like them both! Bourjois is a bit hard to find in the U.S., but you can order it from ASOS, FeelUnique, or Ebay, of course. What products do you consistently repurchase? Do you stick with the same things or do you always try something new?